The United Methodist Church in Grenola began as part of the Cedar Vale Circuit, which was organized I 1872. This was an 8 point circuit with stations at Middle Caney, Cedar Vale, Elgin, Star, Prarie View, Pleasant Valley, Round Mound, Canola-Spring Creek, and Greenfield. J.S. Harryman was local pastor and J. McQuinton was presiding elder. In 1879 the Southern Kansas Railroad was laid from Winfield to Independence and the two towns Greenfield and Canola came together to form the town of Grenola, taking the GRE from Greenfield and the NOLA from Canola. In 1880 Pastor Stapleton called a meeting to organize a Sunday School. Starting with 8 people the group met in various buildings in the new community. A parcel of land had been deeded to the Church from the Grenola town company in 1879 and in 1881 and work was started on a stone building on the corner of Oak and Elm Streets. Stone was quarried from the M.S. Miller farm east of town. Some of the same families whose descendants are a part of the church today contributed money and labor toward the construction of the church, others furnishing material. Some loaned money.. Some of the names are French, Hall, McClure, Logsdon, Dory, and Thompson, also Hewins and Titus the Cattle buyers who were helping make Grenola an important shipping point for cattle. A fund raiser (an Oyster Supper) was held where members of other churches in the community contributed. The amounts given are listed by name and amount in the Grenola Argus of January and February of 1882. By February 20, 1882 the total cost of the new church was $2299.80. Under the leadeship of Rev. D.L. Owens the church was dedicated in March of 1882. In 1906 under the direction of Pastor Ramsburg the front door of the church was moved from the center of the west side to the northwest corner and a balcony was added to accomodate the growing numbers in attendance. Oak pews were purchased. 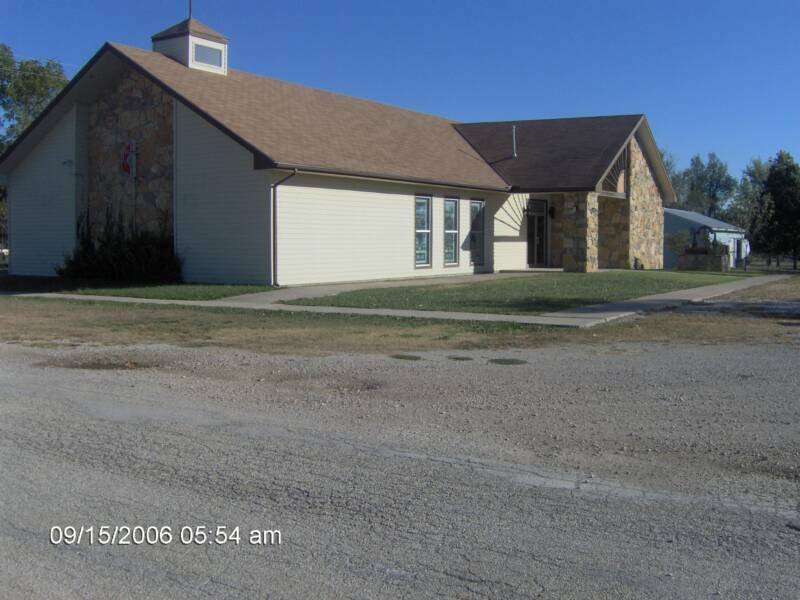 The addition included a vestibule on the front (west side) with a Sunday School room above it, room that could be separated with a roll top door, a large Social room, The entire building was covered with stucco. New oak floors were installed throughout the building. The new addition could be closed off from the new addition with accordion doors. The podium was placed on the south. Stained glass windows called art windows were added. These windows could be seen at a local Lumberyard and purchased for $25.00 including the name of the family or group such as a Sunday School Class. Large holes were made on the East and West end of the original building and banks of windows installed there. Rev. Johnson reported that the total cost of the building project was $14,000. At the dedication service 4,000 dollars in pledges and gifts were received to make up the balance of the debt. From 1880 to 1945 Grenola was a station on the circuit. On 1945 we were placed on a circuit with Moline. The church then had their own resident pastor. A large house on South Main was purchased for a parsonage. Rev. Charles S. Wogan was the first resident pastor in 1950. In 1955 the membership of the church was 156 with an attendance of 93. The population of the town and surrounding area continued to dwindle as well as the membership of the church. The last full time pastor was Francis Lynn. Pastors in 1969. The parsonage was sold and a mobile home was placed on a pad just east of the church for student pastors. In 1976 the church was placed back on a circuit with Cedar Vale and Wauneta. Rev. George Gardner was pastor and in 1979 he led in the formation of the Chautaqua Hills Parish comprising the churches of Moline, Sedan, Elgin, Peru, Wauneta, Cedar Vale, Longton, Elk Falls, and Grenola. The Parish was pastored by 4 ordained elders. Grenola shared a minister with Moline. The mobile home was sold. Again dwindling resources had to be considered and in 1999 the Chautauqua Hills Parish was disbanded. The Grenola church is being served by a part time retired elder, Gary Parsons, and an assistant. Last year Everisto Chikango, a student from Zimbabwe and now by Mark Lofton who is studying to be a local lay pastor. In the 1990’s the old stones in the 1882 Church began disintegrating. Large cracks in the stucco had been patched and repatched, water under the floors had caused dry rot of the supporting timbers. 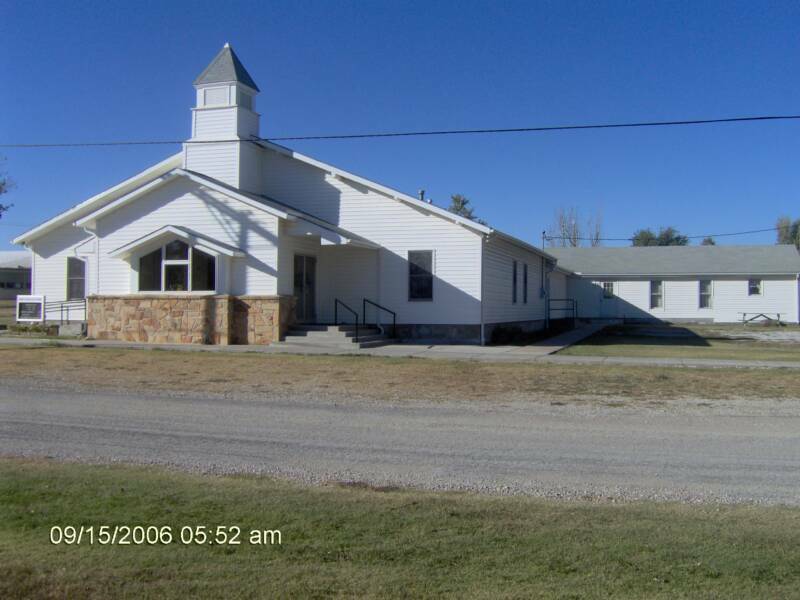 With the help of the Kansas East Conference, Volunteers in Mission and neighbor churches a modern building was completed in 1996. Once again, people from the community, especially those of other churches donated funds, materials and labor. And again the descendants of the builders of the 1882 church made sacrifices of time and money committed to building a Church for the 2000. Parts from the old church were used when possible. The stone can be seen at the front of the Church both on the inside and out, some the stained glass windows were releaded and used, the mahogany accordion doors from the old church, and the oak pews from 1906 are still being used. The large bell made in Boston in 1882 that was atop the original building, was placed on a pipe tower, probably in 1944. In 2002 a stone bell tower was erected near the entrance of the church and the bell is proudly displayed and now sounds each Sunday at worship time. The booths were neatly and tastefully arranged and were full of pretty things, good things to eat and also to look at and the accommodating attendants were kept quite busily attending to the wants of the public. In the evening a fine supper was served of everything good to eat which was enjoyed by many and after this part of the evening’s pleasure was over a nice program was rendered by the young people, songs, readings and speeches. In short the Bazaar in all its appointments was a success. Our history goes back to the little town of Canola. In the spring of 1870, the Hart brothers, John, James, and Hugh, laid out a town site to which they gave the name of Canola. The land was owned by James Reid and H.L. Corum. (We still have Corum Creek just south of town.) The first establishment was a general store belonging to the Hart brothers. They later built a 2-story hotel. John Reid built a schoolhouse. In 1879, the population of Canola was around 100. Just a few miles to the north, there was a rival town called Greenfield. It had been established in 1869 on a claim belonging to A.A. Toby. In 1870, a young man named Robert Lawyer came to Kansas and settled on a claim on the Caney River. (At that time it was called Cana River.) He was born in Ohio, grew up in Illinois, and moved to Bates County, Missouri in 1869. Bob Lawyer built a cabin on his homestead and planted a crop. In December of 1871, Bob returned to Missouri and married Miss Nellie Gardner. They returned to their cabin home near Canola. After a few years, Bob and Nellie longed for a New Testament Church in their community. On January 22, 1876, Bob Lawyer and a young minister, Leonard Mason, called a meeting for the purpose of organizing a Church of Christ with the Bible alone as their guide. Leonard Mason chaired the meeting and Bob Lawyer acted as clerk. Eighteen people responded and became the charter members of the Canola Christian Church. The very next day, January 23, Bro. Mason baptized Lafayette and Myrtle Haigler and Margaret Considine in the Caney River. Isabel Hawkins joined by letter. This made a total of 22 members. The first elders were Robert Lawyer and W.H. Guy. The first deacons were W.T. Fuson and James W. Chaplin. And, of course, the first minister was Leonard Mason. In March of 1877, Bob Lawyer drove his team and wagon 29 miles to Elk City to get Thomas Fanchier to come to Canola to hold a 2-week meeting. There were 20 additions by immersion. In February of 1880, Fanchier held another meeting with five more members added. The congregation continued meeting at Canola for the next five years. In 1879, the Kansas City, Lawrence & Southern Kansas Railroad was built through the southern part of Elk County joining Independence and Winfield. The railroad passed between Greenfield and Canola about equal distance from each. Both towns needed the advantage of the railroad so they consolidated on July 7, 1879 and formed a new town on the railroad. They used parts of both names and called their town “Grenola”. It grew rapidly since the business houses of both towns moved to the new site. By 1884, there was a population of 700. There were 3 general stores, 2 groceries, 1 furniture, 2 drug, 2 millinery, 2 hardwares, 2 hotels, 3 billiard halls, 2 restaurants, 2 blacksmiths, 2 wagon shops, 1 saddlery shop, 2 livery barns and 1 lumber and coal yard. By 1884, the leaders of the Canola Christian Church could see the need for relocating to Grenola. Many of their members had already built homes in Grenola. It was on June 14, 1885, that the Canola Christian congregation dedicated their new frame building on Chestnut Street and became known as the Grenola Christian Church. In the early days, 2 additions were made to the building. A vestibule was added to the front and a 14-foot addition was built across the back. Later this room was partitioned into two classrooms. But in the early days, the ladies wanted a meeting room that was large enough for quilting. Until the 1950’s, the Grenola Church was a member of the Disciples of Christ organization. Each year reports were sent to the headquarters at Topeka. In 1908, the membership was 137. By 1918, it had dropped to 96. It reached a high of 229 in 1924. There were 62 additions that year. Enos O. Wonder was minister. By 1950, membership was down to 130. No history of the church would be complete without mentioning Belle Reid Yates, the church’s only woman minister. She served for 18 years – 9 years from 1913 to 1922 and 9 years from 1928 through 1937. Mrs. Yates was born Isabelle Jane Fouts in 1860 in Iowa. She came to Kansas with her parents in 1874. They took a claim a mile west of the Moline Cemetery. In the fall of 1875, at the age of 15, Belle got a job teaching school for $16.75 a month. Seven years later, in 1882, she began teaching in the Grenola Schools. She met Duncan Reid, the local postmaster, and they were married in 1883. They were the parents of one son, Frank. Mr. Reid died in 1901. Belle carried on as postmaster for several years. It was during this time that she was an active worker in Women’s Relief Corps and did a good deal of traveling and speaking. She preached her first sermon in 1897 when she was stranded by high water in a western Kansas town. In 1906, Belle was married to Abram Yates, a local hardware merchant. Yates was ordained a minister of the gospel. She was 52 years old. The church hired her as minister for $15 a month. A few months later, her salary was raised to $30. When Mr. Yates became ill, they went to Claremore, Oklahoma, thinking the mineral baths would help his health. While living in Claremore, Belle preached at 4 different preaching points. She told the following story about her work in Oklahoma. One Sunday at Vertigris, she walked in just as the superintendent was closing Sunday School. He stopped, looked at her and said. “I will not stay in the house with a woman preacher or one who wears a silk dress.” She walked to the front and took hold of her dress and asked, “Shall I take my dress off?” This broke the tension and they asked her to stay. Mr. Yates died in 1920. Belle resigned her ministry at Grenola in July of 1922. During the twenties, she preached at the Elk City church. She also held many revival meetings, even going as far as Sacramento, California to hold a 2-week meeting. Mrs. Yates had an unusual but very effective method of marriage counseling. Whenever she heard that a couple were having marital difficulties, she would pack a bag and move in with them. She stayed until their problems were worked out. Mrs. Yates was a forceful speaker. She felt that the Word she preached was so important that no noises or confusion should distract her listeners. On many occasions, she would stop and sweetly say, “Will the mother with the fretful baby please take the baby out?” Teenagers misbehaving on the back rows could expect her to stop her sermon, look at them and not continue until the noise ceased. Mrs. Yates said many times that she wanted to die on Friday and be buried on Sunday. It was on a Friday afternoon, November 21, 1942, when several ladies of the church were gathered at the community hall getting ready for their annual bazaar that word came that Mrs. Yates was dying. Vera Jordan and Oea Logsdon went to her home and stayed with her until the end. She got her wish, dying on Friday just before midnight. The funeral was held on Sunday at the community hall to accommodate the hundreds of grateful people who had been helped by her both spiritually and physically. A choir from the church sang. Belle Reid Yates was 82 years old when she went to be with her Master. The following is a news article written by Mrs. Yates on the occasion of the fiftieth wedding anniversary of Robert and Nellie Lawyer. “It was another red letter day in the history of the Grenola Christian Church when the members “took time to be holy” in honoring the golden wedding anniversary of R.M. Lawyer and his wife who have been faithful members of over forty years. He has been an elder all that time and she has acted as becometh an elder’s wife. After the morning service at which time Mrs. Dora Brown united with the church, the people all went to the building where Mrs. Bacus and her class had spread the feast. Here they were joined by many old friends who came to do them honor. Mr. and Mrs. Lawyer were seated in two golden wicker chairs, gifts from the crowd. In front of them were beautiful gold and white chrysanthemums, gift of Miss Dea Hart, and seated with them were 31 relatives and all together there were 134 who ate dinner with them”. In 1944, the church purchased a house to be used either as a parsonage or additional classrooms. The house was moved two blocks up the street. Do you remember how the sidewalk to the east of the church was all broken up? This happened when they moved the building. Harry McGlasson was pulling it with the old county caterpillar. The building was on 2 sycamore logs. He crossed the sidewalk to reach the foundation they had fixed just north of the church building. Joe Samuels was the minister. After he left, there were several student ministers from Phillips University so there was no need for a parsonage. The house was rented. It was not until July of 1954 that it was decided to fix up the old house and use it as a parsonage. The Hughes were the first to live in it. It was also used by the Bumps, Wilsons, Cordells, and Barry Willbanks. Later it was used for classrooms and class parties. In 1971, the church purchased another parsonage about 2 blocks south. Some of the women of the congregation tore the old building down in July of 1973. Our present parsonage was built in 1985. Harvey and Ethel Richardson were the first to use it. They were followed by the Paul Beighley family and then by Wallace and Wanda Wartick. In 1953, thirty-three acres of land was given to the church by Ethel Wilkerson. It was to be a permanent memorial to her parents, J.R. and Sallie Mann. It must be used for church purposes and cannot be sold. At the present, the land is in the soil bank and the proceeds go into the church treasury. Christian Church. The two ministers who provided leadership at this time were Paul Hesser (51-53) and Warren Hughes (53-57). The complete break came in 1957. Board Member Wallace Wartick led in drawing up a church constitution. It was adopted on February 17, 1957. The Grenola Christian Church is a congregation governed body, incorporated under the laws of the State of Kansas. Willis Fowler was minister in 1966 when it was decided to add an educational unit. A building committee of seven was selected to oversee and report to the congregation. They were Byron Stiles, Albert Miller Sr., Frank Hawkins, Carl Reeves, Maxine Fowler, Mamie Burdett, and Walter Smith. The old Cloverdale Church building was purchased for $100. This 24 by 40-foot structure was moved 10 1/2 miles into Grenola. Many hours of labor were donated by members as they prepared this building for use. The completed building contained a 10 by 14-foot kitchen, a rest room, cloak room and a 24 by 30-foot auditorium. The church has always realized the importance of good youth programs. The Christian Endeavor was strong during early years. Later in the forties and fifties, there was an active Youth for Christ. The church supports the camping programs. For years, it has been the policy of the church to pay camp expenses for any child who needs help. Since 1950, 47 young people have attended Bible colleges and are now engaged in Christian work. Youth ministers have been hired to work with our young people. Youth groups meet every Sunday evening. As the church grew, more space was needed for classrooms and other church activities. In 1990, the two buildings were connected. This provided 4 new classrooms, 2 restrooms, and a large fellowship area. In 1996, the congregation saw the need for a larger sanctuary. Work was begun on an addition to the west side of the original building. In 2001, work was begun on a new entrance to the building. This was finished just in time for the 125th anniversary celebration on June 22, 2001. In 2006, the minister is Wallace Wartick, who is in his 19th year with us. Elders are Ronald Allison, Lynn Kelly, Dean Keplinger, Dwane Kessinger, Tom Kessinger, Jack Perrigo, and Dave Wolfe. Deacons are Perry Fulsom, Don Land, Donnie Miller and Josh Kessinger. The work in Grenola is going forward, as the board members, minister, and congregation strive to keep to the purpose as stated in the church constitution.